Recently, we were forwarded such positive feedback about one of our essays for Human Flower Project that we decided to post the original essay here. Let us know what you think! Thanks for the interesting post. Treehugger that I am, I am ashamed to admit that I have never considered wildlife value for street tree planting. Maybe now that "green" thinking is more common, municipalities can be prodded into planting wildlife friendly trees. 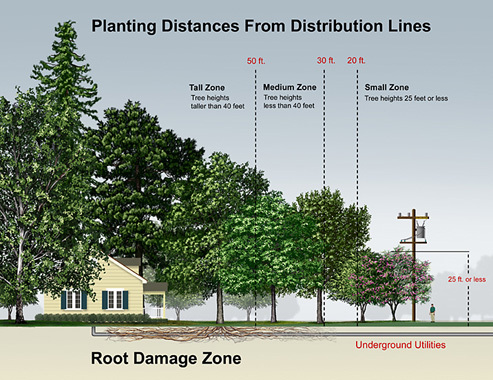 The local Va. Tech research station has a planting of many trees under mock power lines to give you an idea of what can be used. Hey, nice job on this, I think you should attach it to your CV when you launch out of academia into jobland. You could be a great consultant for municipalities, helping them to rewrite their street tree policies to be more "green"! That Oakland list is pretty paltry and some of those trees are kind of blah. Seattle has a slightly bigger list but the trees tend to be planted in monocultures on a street and it can be kind of boring. I like it when it's more of a jumble. Across the street are two getting-big gingkos, a hawthorne that hosted a rogue bee swarm the other summer (exciting!) and some rather blah purple-leaf plums. I need to replace my awful crabapples, but am dragging my heels on a decision. Our power lines are in the alley, so I might have a little more leeway in terms of eventual height. Hm. Thanks for getting me thinking about this again! Oh, that live oak is magnificent. Les: Have you heard of Virginia Tech's "Stormwater Management with trees and structural soils project"? The project website is http://www.cnr.vt.edu/urbanforestry/stormwater/. Karen: Some crabapple fruit can be eaten as is or jellied. Do you know about Darrin Nordahl's Public Produce: The New Urban Agriculture? Thank you, Green Waste Recycle Yard.